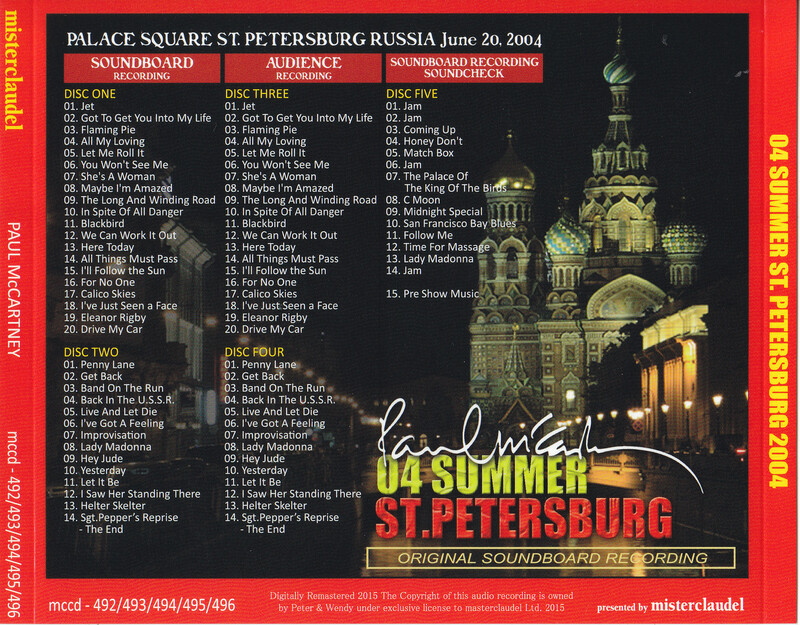 Latest of M Claudel, the June 20, 2004, the Russian performance for the second time Paul, is the St. Petersburg performance. 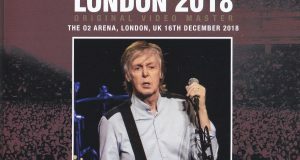 Since 2002, but is Paul that are doing the tour as every year, only 2004 was entitled “04 SUMMER” in early spring short European tour was held. While a small number live, whimsy of set list, such as the song that is played only on this tour, rare song selection is one that does not look at the other kind, is a very popular tour. In such short European tour, speaking of highlights, along with Glastonbury, following the previous year’s Red Square, will include the St. Petersburg performances became the second time of the Russian performances. 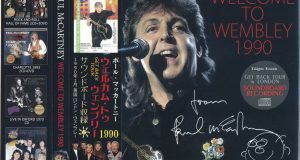 This pattern of concerts are summarized in about 1 hour, much has been released as a video work with the square performances of 2003 red, there is no doubt that it was a concert memorable also for Paul. In fact, it is not possible to accommodate the large crowd in the usual venue, to make a stage in one corner of the city, where was carried out in unprecedented scale of performing the concert, and it was a St. Petersburg performances of this year. This work, the historic St. Petersburg performances a complete recording the sound board, even the performance of the audience sound source, will be the ultimate set plus the sound check sound source. First disc 1 and 2, recorded sound board sound source. 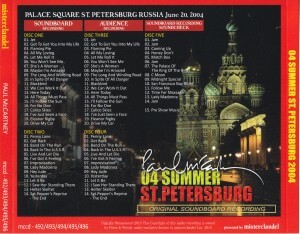 Speaking of sound board sound source in St. Petersburg performances, from Piccadilly Circus label, are real-time in the outflow sound board sound source release, then the video of professional shots outflow, pro shot video under the title “04 SUMMER” than M Claudel label You have already been released. However, this work, and to release the sound board sound source but great in quality and clear enough not be compared at the time, the difference is if you can listen to the sample, and I think I seen soon. At all, Lost Live like album, it’s a perfect stereo sound board. Be superior to Piccadilly Circus label that was released earlier, of course, above dramatically than professional shot the video accompanying voice. Of course this work, rather than the voice of dropping the video, I new perfect outflow sound board that was obtained. Anyway, listening to the sample, please feel the quality! ! Disk 3 and 4, recorded the same performance in the audience recording. Although few songs at the beginning falls sound quality, since from “You Will not See Me” in a very high-quality audience recording that is spread in the clear, I met the 04 SUMMER tour there is no good audience recording of very sound, very I can say a valuable source to. Along with Russia of enthusiastic fans, and definitely be immersed in the atmosphere are on the day of the venue! Long and far away the influx of western culture from the era that was refused, thus the songs of The Beatles at the center of Russia it is possible to enjoy by the person playing. It is that it was not considered in the Cold War era. And disk 5, the sound check sound source in the venue of here in St. Petersburg, which also has been recorded in the sound board. Speaking of sound check of Paul, the main part or to play a number of different songs and, and those that can be enjoyed by itself, here that to record the day sound check sound source, more this set is said to have become perfect . It starts with a light jam, including the “C Moon” familiar in the sound check, was have songs of apple “Matchbox” and “Honey Do not”. And I have a wide range of playing up to Rupert of the song. Noteworthy is that you are playing the “Follow Me” was still unpublished at this point. After You are the album “Chaos”, is that in the same year of Glastonbury This song was premiered on stage. Probably also serves as a rehearsal of towards it, and Will was playing in sound check here St. Petersburg. In addition, at the end of the disk 5, had been actually washed away by a concert venue, the DJ sampling music that was used in the opening, which is also fully recorded in the sound board. After compared evolving from 2002 to the opening performance of 2003 in “LOVE” of Cirque du Soleil, but now somewhat small and the impression, for over 18 minutes, along with the music sampled the past songs of Paul, on stage, and DJ who wears a costume like a clown, dancers I will liven up the venue waging a performance. And when the excitement has reached the apex, the curtain of the stage Paul of oil has been drawn to slide sideways, band members appeared. Along with the loud count, as it is called roll into the “Jet” in the opening, which is also 04 SUMMER excitement full of directing the only tour. Its valuable DJ sampling music, I fully recorded in the sound board. In this way, but the sound quality is the perfect St. Petersburg performances, and say the contents and, this also awesome. 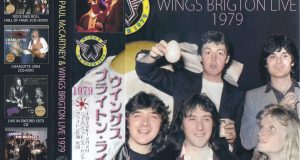 In addition to his second is a Russian performances, sometimes shooting had entered, enthusiastic performance of Paul and the band will let almost feel the saturated enough energy does not fit to the music. After all, as this concert is not to wet weather, much of the pre-rain clouds flew a jet injection, it is an event of raising the nation. Indeed President Putin, that do big. And although I fired up the Paul also feels well, and as it feels maybe’re nervous at the same time, some of the songs lyrics mess (laughs). Such as “She’s a Woman” and “For No One” is, in I wonder to where the original lyrics, you can see it that has been cut in the more official DVD. Such as “She’s a Woman” is “I live because (I since not a lip-synching)” and, it is interesting because say and how to insert in the middle of the song. Others, Paul of clumsy it is possible to listen everywhere the Russian, Oh, you really made me think and Na he has been playing in Russia. Latest of M Claudel, the June 20, 2004 the former Leningrad, St. Petersburg performances, complete recording with a perfect stereo sound board. From the opening DJ performance to ending calls, just complete recording. Moreover also I have to set at the same time audience recording of the day of realism preeminent. In addition further, that recorded in the day of the sound check also sound board, making it the culmination of St. Petersburg performances in 2004. Permanent preservation Athletic Press board of beautiful picture disc specifications. With Japanese band.